If you ever get to Austin, be sure and visit Hamilton Pool! This place is awesome. Wait, let me capitalize it all because it's AWESOME. There, that's better and more accurate. It really is an amazing place, and it's only about 30 minutes or so from downtown Austin. Ok, maybe a little more because the road winds around a lot, but still it's well worth the drive out there. Just be sure to call ahead and make sure they are open. 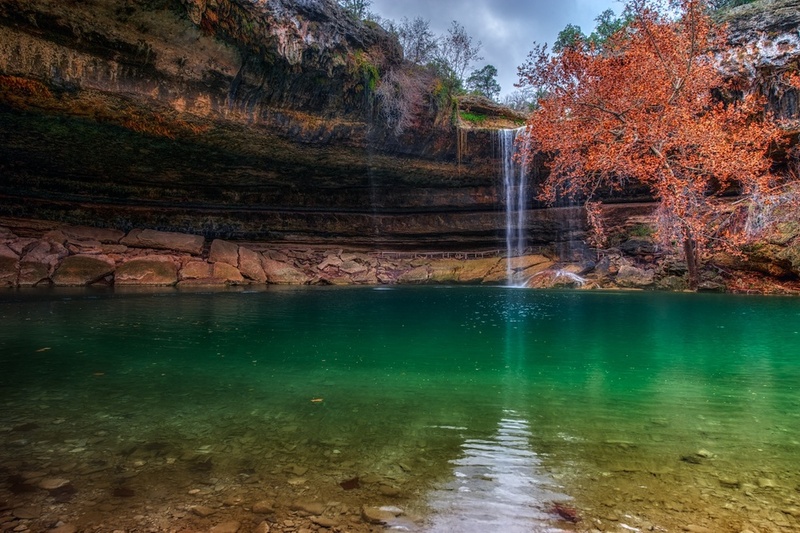 As you can see there is an awesome waterfall here at Hamilton Pool, and it's about 50 feet high up there. But to me the best part is the grotto that circles up underneath all that rock. You can walk all the way around it, and I recommend that you do just that. Just note that when you are close to the falls, the spray wets the rock and it gets a little slick. This is a State Park, and as such there is a small entry fee of $10, if I remember correctly. And I believe it is cash only, so plan ahead. Anyways, this place was created when a dome of an underground river collapsed many years ago, so that resulted in the lovely rock overhang. The pool actually is that sort of jade green color - that's not a trick on my part. I showed up when they opened one day, which is definitely the way to do it if you want to get a shot like this without tourists in it. I got into the park and literally sprinted down the trail to get here, since there were cars coming in behind me. Luckily, it was a nice Fall morning and there were awesome clouds in the sky. And those are the main two reasons I went: it was Fall and I was hoping for some decent color in that tree (got it!) and it was cloudy, so I was hoping for something other than a boring sky (got that too!). It worked out pretty well that day!